Time for another recipe (the 7th in a baker’s dozen). This is another that goes great with tea. 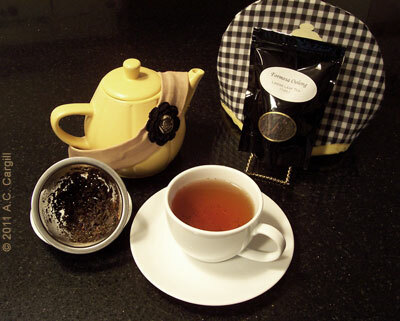 Be adventurous and give her recipe a try with a pot of the tea named and assess the pairing for yourself. No picture available — yikes! So, here are the Double-Duty Measuring Cups the cook used to make them. There is never a bad time for brownies. And any excuse to make them is legitimate, no matter how flimsy. In this case, she was trying out a new set of measuring cups. She said that these brownies are “a variant of the recipe for Fudgy Cocoa Brownies by SACO Foods”. This version isn’t as rich as you’d expect, but she points out that this is good for enjoying a second helping without risking getting a tummy ache or a big case of the “guilts.” Now, that’s MY kind of brownie! Formosa Oolong seems the perfect tea to go with these lighter tasting brownies. Hubby and I did a taste test of it about a year ago and have been entranced ever since. The version we tried was more oxidized than others but could still undergo multiple infusions, giving a walnutty flavor to the cup each time. There was also a smokiness, a smooth feel, and no bitterness. Keep you infusion times short — a maximum of one-and-a-half minutes for the first infusion and two minutes for the second one. This will give you a more even flavor each time. Hope this works for you. Feel free to comment here with your experience, and watch for the next pairing to be posted in November. Good article. I find I must always have some tea whenever I have cake or any sweet dessert. Mmmm, interesting ideas! Whenever we go to a fish restaurant – an old fashioned one for good old fish and chips, I always drink tea… and it will probably be made with the cheapest tea bags you can imagine, but somehow it’s a great pairing, especially with white bread and butter on the side – oh and mushy peas with plenty of white pepper! Gee, Lois, you’re making me hungry! I’ve been to the UK and really miss the fish with mushy peas. Mmmmm!